The Festival of Nations event gives students and community members a trip across the world without leaving Vermillion–and it’s done all through food. “People cook from their heart and they can share their culture,” said Anita Shrestha, president of the USD International Club, whose annual potluck-style event featured dishes from 35 countries, including Pakistan, India, Spain, Germany, France, Egypt, Ethiopia and others in the MUC Ballroom on Saturday. Students, faculty and community members volunteered to prepare traditional dishes from countries all around the world, and although the event could be catered, the International Club prefers having homecooked dishes to capture authentic elements of the meals, Shrestha said. The spices and traditions contained in a nation’s cuisine vary from country to country, and not all are available or familiar in America, international student advisor Semehar Ghebrekidan said. The Festival of Nations helps brings them all to Vermillion. International Club hosts multiple events throughout the year, but the Festival of Nations is often the largest; this year it saw over 400 individuals alone. Naivetya Patle, a sophomore international studies, political science and economics triple major, served as the emcee for the second year at the festival and said it’s the organization’s largest because it’s also its most diverse. To accompany the food, the Festival of Nations featured dancing, games and competitions. Shrestha said they decided to include competitions this year to improve audience engagement. 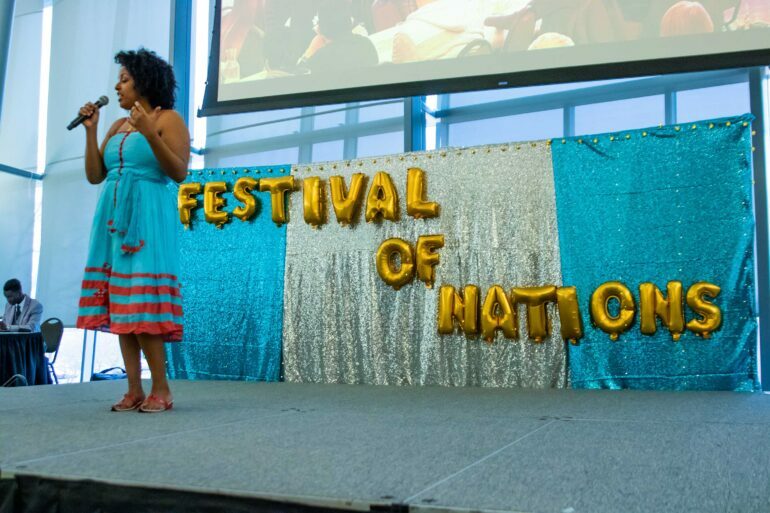 This year was Ghebrekidan’s first time attending the Festival of Nations event. She said she initially expected this event to run similar to International Night, the fall event put on by International Club which is typically more relaxed. However, she said the Festival of Nations’ moving parts added excitement to the program.